The University of Cambridge was founded in 1209 and granted a royal charter by King Henry III in 1231. By the late 12th century, the Cambridge region already had a scholarly and ecclesiastical reputation, due to monks from the nearby bishopric church of Ely. The colleges at the University of Cambridge were originally an incidental feature of the system. No college is as old as the university itself. In medieval times, many colleges were founded so that their members would pray for the souls of the founders, and were often associated with chapels or abbeys. A change in the colleges' focus occurred in 1536 with the Dissolution of the Monasteries. King Henry VIII ordered the university to disband its Faculty of Canon Law and to stop teaching scholastic philisophy. In response, colleges changed their curricula away from canon law, and towards the classics, the Bible, and mathematics. Cambridge University has close ties to the investigation of paranormal phenomena. The Society for Psychical Research’s (SPR) first president was Henry Sidgwick, professor of moral philosophy at Trinity College, Cambridge. His chief Cambridge associates in the early stages were Frederic Myers, a classical scholar with wide-ranging interests, and the brilliant Edmund Gurney, who was to develop a pioneering interest in hypnotism. Other prominent figures were the physicists William Barrett, Lord Rayleigh and Arthur Balfour. These Victorians applied themselves patiently, and for little reward, they sifted and corroborated reports of spontaneous paranormal experiences. 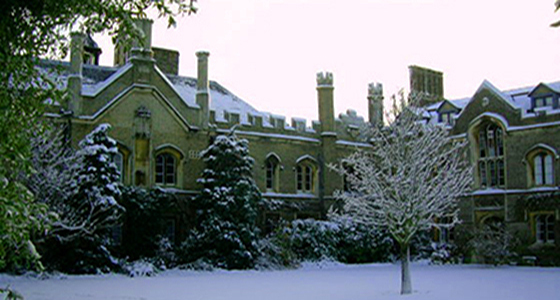 The SPR has a vast library held at Cambridge University and is available to scholars of the paranormal. Rachel: I was fortunate to work at Cambridge for a few years and whilst on assignment, I had sole access to college buildings for two hours each evening. Maybe I should not have been quite so surprised at how exceptional the EVPs were to be. If Cambridge excels academically, I reasoned surely those who had studied or taught here and passed over, would be very curious to have an opportunity to communicate. Although I have already stated I was alone in the building, the clips you are about to hear will undoubtably cause you to question my veracity. EVP 1: Have we missed death?